Robert Craig Knievel was born on the 17th October 1938, in Butte, Montana USA of German ancestry, and passed away on 30th November 2007 in Clearwater, Florida. He was known for being a stunt performer, perhaps best remembered for his performances with his motorcycle. He also entered in the Guinness Book of World Records for suffering more than 433 bone fractures. Have you ever wondered how rich was Evel Knievel? According to sources, it was estimated that the overall size of Evel’s net worth was over $3 million, earned through his career as a professional stunt performer. Evel Knievel was the son of Robert and Ann Marie Keough Knievel, but his parents left him, so he was raised with younger brother by grandparents Ignatius and Emma Knievel. When he was only eight years old, Evel attended a Joie Chitwood Auto Daredevil Show, and from that time he knew what he want to be in life. He finished elementary school, and later attended high school, but he quit to find a job and help the family. 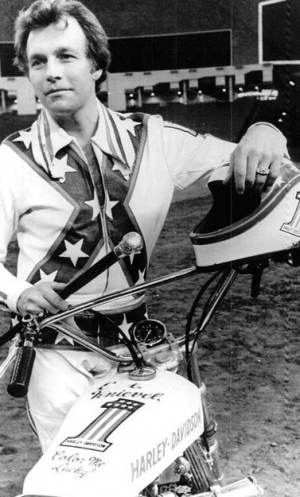 Before he decided to become a motorcycle daredevil, Evel had numerous jobs in order to support his family, including being a professional hockey player for the Charlotte Checkers of the Eastern Hockey League, and he also founded Sur-Kill Guide Service, which provided hunting and fishing trips to people for a certain fee, however, this business fell apart, as he broke the la by, taking his customers into Yellowstone National park to hunt. Furthermore, he competed in ski-jumping and was also an insurance salesman, but quit that job after few months. Kneivel moved to Moses Lake, Washington, and founded a Honda motorcycle dealership store, but it closed pretty soon, as it was hard to sell Japanese motorcycles in 1960s America. After that, Evel found a job at the Don Pomeroy’s motorcycle shop in Sunnyside, Washington, where he befriended Jim Pomeroy, who taught him to do a ‘wheelie’ and ride while standing on the seat of the bike. From that, he started a career in motorcycle jumps and stunts. His first jump was a 40 feet distance over boxes of rattlesnakes and two mountain lions. In no time he became a celebrity in the Washington area, and was soon able to hire more stunt performers, and also found a sponsor in ZDS Motor Inc.
Evel’s first official stunt was performed at the National Date Festival in Indio, California on the 3rd January 1965. From that point on, his career went only upwards, until his retirement in 1977, when he had a terrible crash and couldn’t fully recover, so Evel decided to retire. During his career, he completed over 70 spectacular stunts, which gained him the eternal nickname “American Daredevil”, and also an induction into the Motorcycle Hall Of Fame in 1999. Some of his stunts included jumps over 16 cars, over Snake River Canyon, over 14 Greyhound buses, and numerous other jumps of distances over 100 feet. These shows became the main source of his net worth during those years. However, some of his jumps were not as successful as others, which resulted in a record setting 433 broken bones over the course of his career, which earned him a Guinness Book of Records induction for the most broken bones. Several years after his retirement, Evel signed a deal with composer Jeff Beck to create a rock opera about his life, which also added to his net worth, and to speak further of his life after retirement, Evel partnered with the Six Flags St. Louis which resulted in creation of roller coaster named after Evel. Regarding his personal life, Evel Knievel was married twice. His first wife was Linda Joan Bork, with whom he had four children; the couple was married for 38 years until they divorced in 1997. Two years later, he married Krystal Kennedy. Although they divorced in 2001, she lived with him until his death. He died from Idiopathic pulmonary fibrosis at the age of 69. 1 His red, white, and blue suit with cape he wore when he performed his stunts. 2 Famous for his spectacular motorcycle jumps in the 1970s and his equally spectacular accidents while doing them. 1 Some of his motorcycle crashes happened because, once his bike left the ramp, he did not try to maintain control and was simply "hanging on for the ride". Later stunt riders discovered that by continuing to throttle and steer (as though the bike were still on the ground), they could maintain control and avoid crashing. 2 Inducted into the Motorcycle Hall of Fame in Pickerington, Ohio in 1999. 3 Was a high school dropout. 4 A delinquent in his early life and frequently in trouble with the law, he picked up the nickname "Evel". 5 His fortunes reversed by the end of the 1970s, after news of his assault and battery conviction broke, and he fell into alcoholism and depression in the 1980s. He enjoyed a mini-comeback in the 1990s in TV commercials and promotional appearances, but expressed regret that he had set no money aside during his heyday, to take care of his family later. 6 Contracted Hepatitis C in 1993 due to blood transfusions required from his many accidents. Underwent a 1999 liver transplant and numerous other surgeries that left him largely disabled. 7 Caught in the moment, after a dangerous 1999 stunt on Fox Network, proudly proclaimed, "White men *CAN* jump! ", in humorous defiance to the basketball movie, White Men Can't Jump (1992). 8 Settled a lawsuit with singer Kanye West, who had used Knievel's image and motifs in a music video, a few weeks prior to his death. West's own mother passed away only weeks before the case was settled. 9 Remained romantically involved with his second wife, Krystal Kennedy-Knievel-Knievel after their divorce, and they continued to live together. 10 Grandfather of Krysten Knievel. 11 Father of Robbie Knievel, Alicia Knievel, Emma Knievel, Kelly Knievel and Tracy Knievel. 12 Owned a Honda dealership in Moses Lake, Washington in the mid-1960s; any potential buyer who could beat Knievel at arm-wrestling got $500 off their car purchase. He formed a traveling stunt show called "Evel Knievel's Motorcycle Daredevils" with other cyclists, as publicity for the dealership. 13 When first written about by the press, he insisted that his nickname not be spelled with an I; knowing his fans were mostly youngsters, he didn't want parents to perceive him as "evil", or as an evildoer. As a public figure, Knievel promoted a healthy, active lifestyle for young people. 14 Is the cousin of NFL Kicker Adam Vinatieri. 15 Suffered 35 broken bones as a result of his motorcycle daredevil antics; a Guinness-certified world record. 17 His son, Robbie Knievel, took over his father's mantle as stuntman and daredevil, even completing the jump over the fountains at Caesar's Palace in Las Vegas, which Evel failed in 1968.